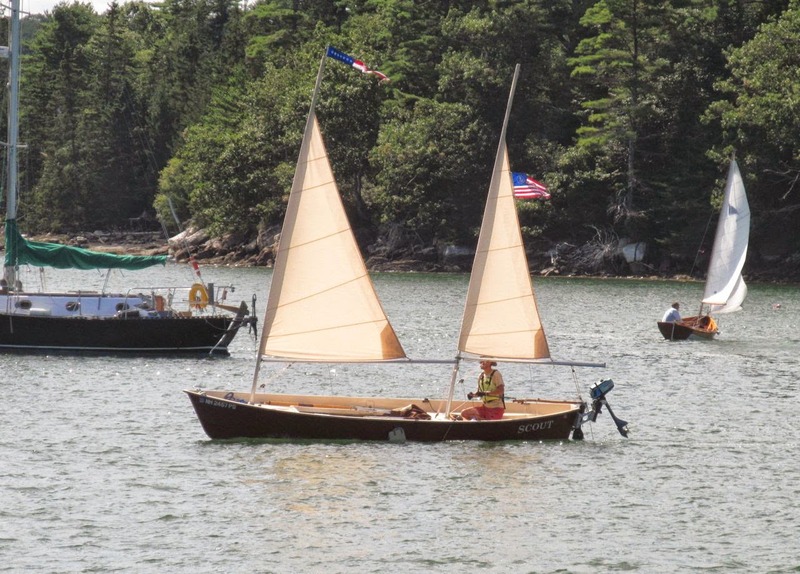 Goat Island Skiff Amateur Style and the Sea Pearl 21 Too: Small Reach Regatta 2011! Hello Intrepid Readers! 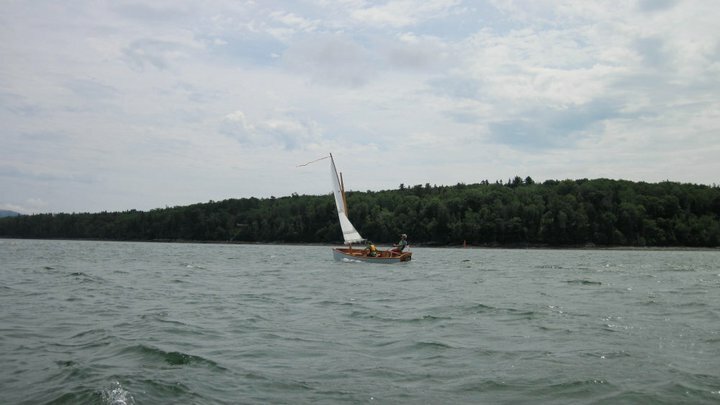 Me, myself, and I, along with my wife and my Goat Island Skiff have just returned from a long weekend at Lamoine State Park in Down East Maine, just across Frenchman Bay from Acadia National Park! Not only was the location spectacular, but we sailed in company with dozens upon dozens of other small sail and oar boats! Yes Reader, I can feel the perspiration on your brow already, for I am referring to the legendary Small Reach Regatta! WOOT WOOT! Due to constraints on my end I made it to Lamoine on Thursday morning as opposed to Wednesday night so I missed the meet+greet, but that's OK. I enjoyed three days of sailing and camping and am already looking forward to the next SRR. Remember: You can click on any picture and then enlarge it to get a bigger one if you want bigger pictures. I can also email you the original huge pictures if you would like a copy. Just leave a comment and we'll get in touch. Day One: Lamoine State Park to Bean Island. Winds were light. I was the last boat off the beach and made good time but made a strategic error and stayed out to sea in hopes of better airs. There was some venturi effect around the last point (Hancock Pt) and I was promptly passed by several of my peers as they blasted around the point. Oh well! We got to the backside of Bean Island, beached, and ate lunch! The beach. Find the Goat! Goat Island Skiff surrounded by awesome. 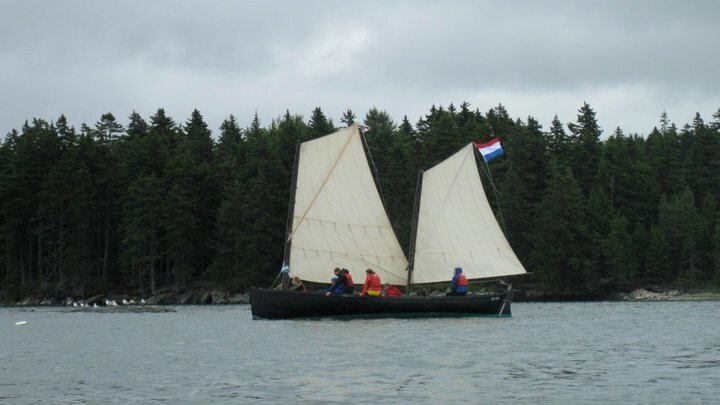 Some Caledonia Yawls on the left and a Pacific Pelican on the right! After lunch I meandered around the island and relaxed, and was one of the last sailboats off the island. I didn't feel like rushing, but watched some of the fleet head out. A Superseed which supersedes the Melonseed. Then I busted off of Bean Island and did a circumnavigation only to get becalmed on the way back. No big deal. A little bit of rowing and I made it to some wind and we were off again! CCBB and Co. Notice patriotism. Day Two was a sail down to some geological formations called the "Ovens" which are caves in the cliffs. Allison and I ventured down to see and promptly ended up getting sucked into an oven, which meant down came the sail and out came the oars, toute suite. Afterwards, a spirited upwind slog to Thomas Island for lunch! More Awesome. A Don Kurylko Myst. 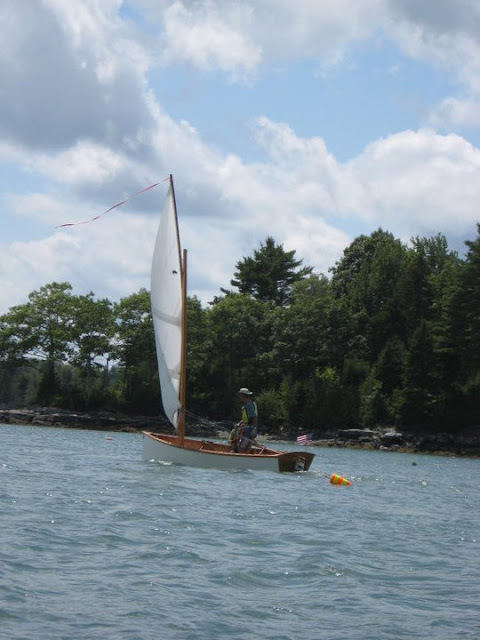 Goat Island Skiff back at Lamoine on the Beach. Acadia in background. YEAH! Day Three was an upwind slog up the Skillings River. The final destination was going to be a small cove all the way up at the top. It was a double whammy, we had the current with us initially but it turned about half-way up for us. Allison and I doubled down and made it happen, slipping into the cove, rafting up with some others, stuffing PB+J into our mouths before setting back down river before we got caught in the mud. On the way upriver, there was one portion of the fleet ahead of us, a small pack of three, and everyone else behind us. Acadia in the clouds with the rest of the fleet behind us. The pack of three consisted of a Coquina, a Core Sound 17, and our Goat Island Skiff. The three of us tacked and tacked all on top of each other but keeping company, until the skipper of the Coquina decided to use the traveler on his rig, and he just blasted out of there. I mean, he took off. So gorgeous. This is about where she took off once the Skipper started using the traveler. BOOM! Gone. That left us and Joe, who was skippering his son's Core Sound 17, which was a High School project. Note cannibalized sails off other boats. Love it! The slog was a slog, but made bearable with the Coquina and Joe to share most of it with. Joe is a 4 realz Pirate! Up at the top of the river, we rafted up! The way back was better. Current and wind at our backs we speedily made it out of the river and back to Lamoine where we frolicked some more with the good wind and rapidly clearing skies. Crotch Island Pinky-- A Dutch family borrowed this from The Apprenticeshop and proceeded to sailed the Living Baloney out of it! So awesome! Acadia and the fleet that didn't make it ahead of us now. Dragging my fingertips in the water hiking out like a hero. Well, it was an awesome weekend, for sure! I can't wait to get back next year and do some more sailing with other boats! 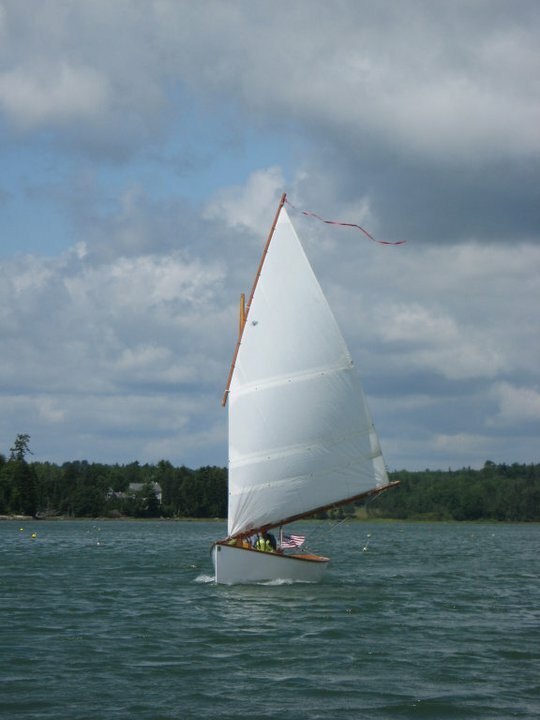 I sail alone all the time, and for one weekend, I can sail in a huge fleet of sail and oar boats and dominate the waves! For some more incidental pictures, and the ones above, please see my album with my entire collection. Until next time Intrepid Readers! nostalgic already. Here's to next year! Thanks for photographing my husband, Joe, and our son's Core Sound. You captured their essence! Anon, no worries it was a pleasure to sail with Joe! Very cool HS project, that kind of building is right up my alley. I wish we had more time to hang out and sail together-- lots of fun to be had by all. Feel free to go to my album and save the pictures you would like of Joe and the CS for your personal use! Hopefully this isn't too old of a blog that you don't get this. Steve from Manchester NH. Met up at the small craft show in Portland. Email is sdahms@yahoo.com I can't choose other than Gmail account. Excellent to finally meet you and Clint and hopefully next summer my girlfriend and I are going to the small reach regatta.